Club Aluminum Cookware – Where Can I Find You? Mirro Aluminum Company has launched a new line of its Club aluminum cookware. Although the predecessor of its new line or the vintage club aluminum cookware is still sought after by few cookware enthusiasts, it is already hard to come across nowadays. Club aluminum pots and pans in the earlier times were offered and sold directly to potential buyers. The name of the company back then, which created the Club cookware, was Club Aluminum Utensil. The merchant would normally convince customers by doing a demo of the cookware. He will cook a nice meal, with the prospect buyers as his audience, to persuade them to buy the cookware. This was during the 1920s. Thi s marketing strategy seemed to have not worked in the long run as the company folded after a more or less 10-year run. Over several years, it has been bought and sold by several companies until Mirro Aluminum survived it until present. It was Herber John Taylor who had put Club aluminum cookware in its present glory. He is a Christian businessman who authored and popularized the Four Way Test. He came up with the Four Way Test to set the correct work conduct in the company which is in line with the teachings of Christianity. His strategy has worked and we now all have the possibility to buy their Club aluminum cookware for sale. In the early times, Club aluminum pots and pans came in various radiant colors like red, teal and peach. It is made of cast aluminum and cast aluminum pans have better heat retention. It is quite heavy but the latest cookware sets have been upgraded for more comfortable use with easy to use handles. The underneath exterior of the pans have circle grooves. If you are looking for the original Club aluminum cookware, the internet is your best bet. By original, we mean the older, colorful cookware they made in the early times, not the latest line. It may be a bit pricey because it is already rare and may be considered a collector’s item and also one of the best pots and pans which graced our generation, so this is expected. 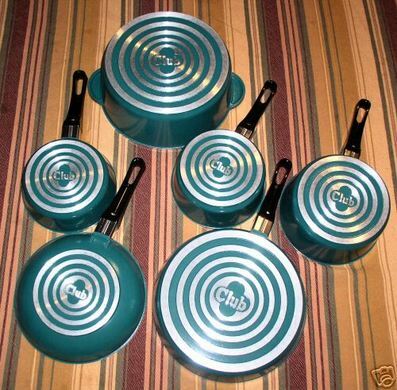 There are unused and pre-loved Club pots and pans being offered in online shops. Be careful and thorough, though, when dealing online. Make sure you know you are getting from a reliable seller. Check cookware reviews and ask around the online community for the reliability of your seller to be sure.